We are proud to announce that Managed TLS now supports wildcard certificates. To set up a Managed TLS Endpoint using a wildcard certificate, simply use the wildcard format when specifying your Custom Domain (e.g. *.aptible.com). Note that you’ll have to use dns-01 validation to validate a wildcard certificate. In any case, the Dashboard or CLI will walk you through the CNAMEs you need to create to proceed. We’re proud to announce that we have added support for InfluxDB as a database on Enclave. InfluxDB is a high-performance time-series database, which we’ve been using ourselves for our Container Metrics. It works particularly well with Grafana to quickly create insightful Dashboards. Adding InfluxDB as a Database on Enclave was motivated by the introduction of Metric Drains, but you can of course use it for any use case. Like any other supported Database, you can launch an InfluxDB Database through the Dashboard, or using the CLI. Enclave now automatically re-configures MongoDB replica sets when restoring from backup. Prior to this change, this reconfiguration step would have had to be performed manually. Here’s why: previously, when restoring a MongoDB backup, the new MongoDB instance would start with the replica set configuration that was in effect when the backup was created. This would cause the new MongoDB instance to try and join your existing database’s replica set. This, in turn, would fail because the new MongoDB instance was not a member of your existing database’s replica set, and the new MongoDB instance would transition to REMOVED state. Now, when restoring a backup, you precisely don’t want the new MongoDB instance to become a member of your existing database’s replica set (however, note that we do support MongoDB clustering when you need it). Indeed, you probably want to use the new MongoDB instance for troubleshooting, development or reporting, and the last thing you want is for changes you make on the new MongoDB instance to affect your existing database! The right approach in this case is to reconfigure the new MongoDB instance with its own independent replica set. Until now, this was a manual process, but as of today, Enclave does it automatically for you as part of the backup restoration process. 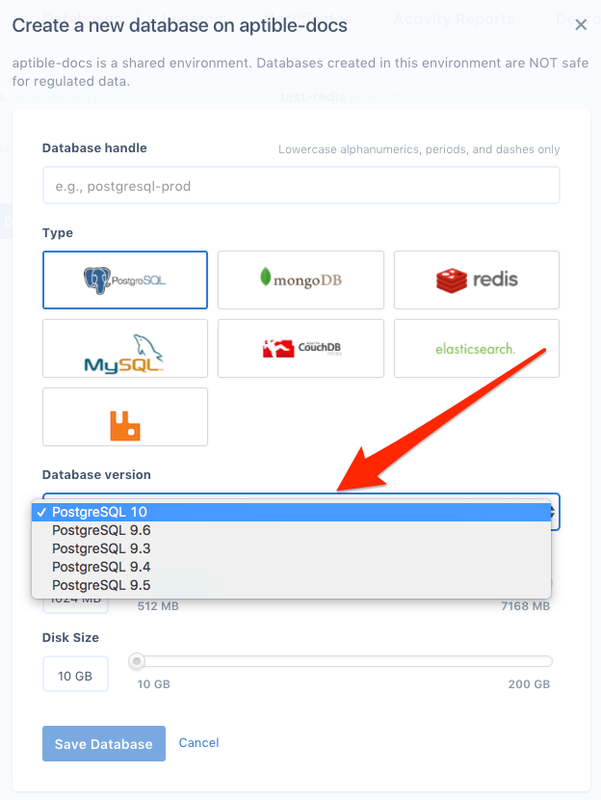 Provision a new PostgreSQL 10 database, then dump the data from your old PostgreSQL database to the new PostgreSQL 10 database. This is the best approach for development databases and non-critical production databases. Contact support to schedule an in-place upgrade of your database. This is the best approach for critical production databases. We’re happy to announce that TCP and TLS Endpoints have left private beta and are now generally available in Enclave! Compared to Enclave’s other Endpoint type (HTTPS Endpoints), TCP and TLS Endpoints are lower-level primitives that give you more flexibility. For example, you can use TCP or TLS Endpoints to deploy non-HTTP apps on Enclave, or take ownership of TLS termination in your app. One particularly notable use case for healthcare companies is to run a Mirth Connect receiver to ingest HL7 data. Note that, being lower-level primitives, TCP and TLS Endpoints do not include as many bells and whistles as HTTPS Endpoints. In particular, they do not currently automate zero-downtime deployment (but you can of course leverage them to architect that yourself). Read-only access is already available in the Dashboard as well. Read-write access will be available in the Dashboard soon! Database Backups can now be restored across different Environments on Enclave. This change lets you easily support workflows that involve restoring backups of production data for analytics or investigation into lower-privileged environments. aptible backup:restore "$BACKUP_ID" --environment "$ENVIRONMENT_HANDLE"
To make sure you don’t accidentally transfer sensitive or regulated data to a non-compliant development environment, this feature ships with an important safeguard: while Backups can be restored across Environments, they cannot be restored across Stacks. For example, this means data that was stored in a production PHI-ready environment can’t accidentally be restored into a non-PHI-ready development environment. The Dashboard now provides CPU utilization metrics for apps and databases. 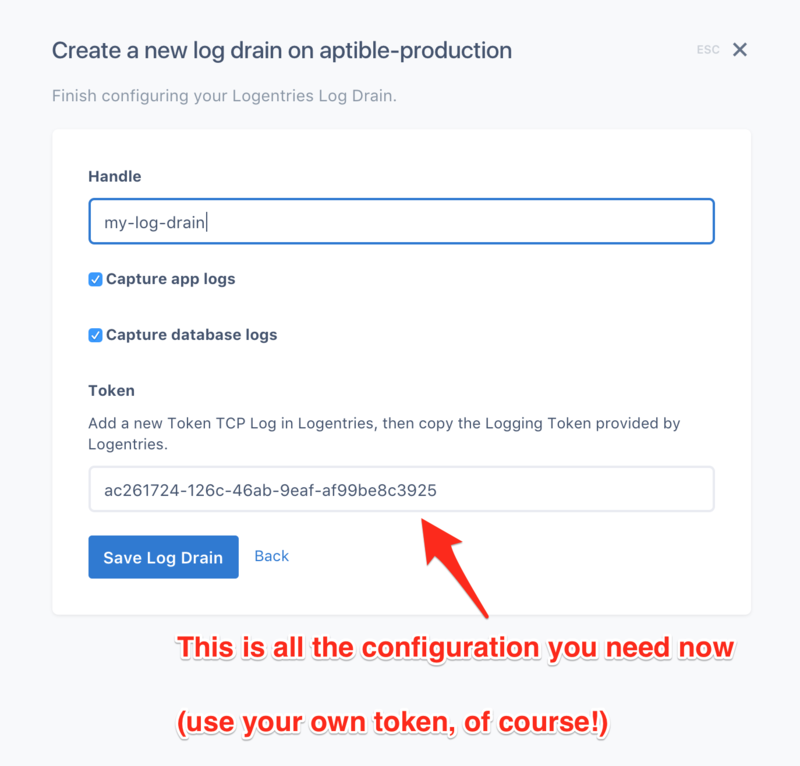 This change gives you more visibility into the resources used by your containers, and can help you make better scaling decisions. By default, Enclave only enforces CPU Limits on shared stacks (i.e. non-production), but you can opt-in to CPU limits for production stacks via a support request. Containers are allocated ¼th of a CPU thread per GB of RAM. For example, a 1 GB container should use no more than 25% of a CPU thread, while a 4 GB container should use no more than 100%. For more information, review our documentation on CPU limits. We’re proud to announce that we launched a new documentation site for Aptible! 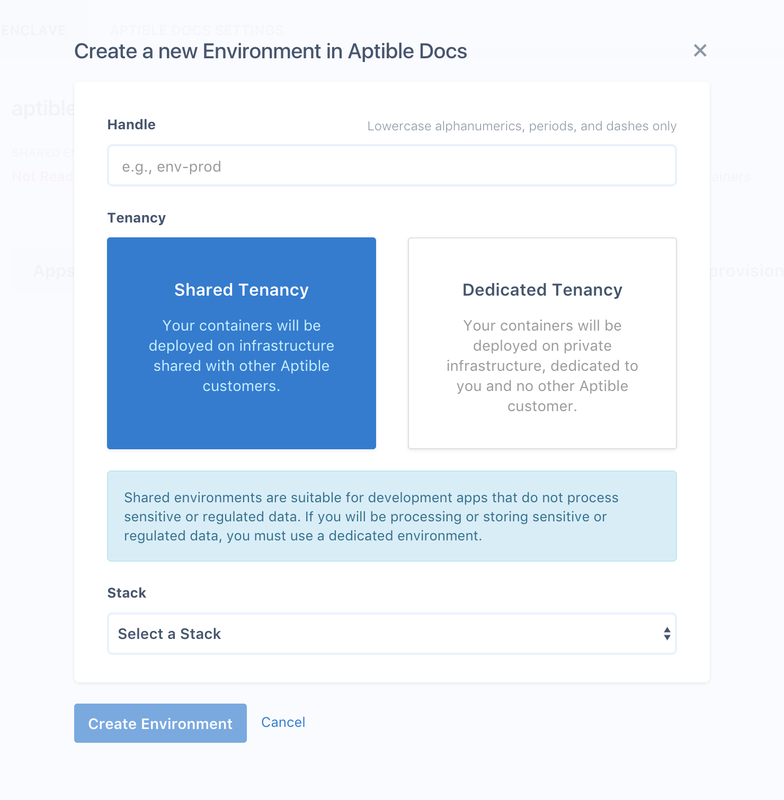 Aptible’s documentation site — like many startups’ — originally started as a FAQ, collecting questions that came up frequently in support tickets. Over time, it evolved with the addition of new features and additional support resources, yet retained its original FAQ structure. But, with Enclave’s expanding feature set and the introduction of Gridiron, that was no longer sufficient. In contrast, our new documentation still includes the original FAQ resources, but it complements them with comprehensive reference material, so you can know exactly how the features of Enclave and Gridiron work, and how they interact together. Check out the new docs now! We’re proud to announce our latest open-source project: Supercronic. Supercronic is a cron implementation designed with containers in mind. Why a new cron for containers? They purge the environment before running jobs. As a result, jobs fail, because all their configuration was provided in environment variables. They redirect all output to log files, email or /dev/null. As a result, job logs are lost, because the user expected those logs to be routed to stdout / stderr. They don’t log anything when jobs fail (or start). As a result, missing jobs and failures go completely unnoticed. To be fair, there are very good architectural and security reasons traditional cron implementations behave the way they do. The only problem is: they’re not applicable to containerized environments. You can persist environment variables to a file before starting cron, and read them back when running jobs. You can run tail in the background to capture logs from files and route them to stdout. You can wrap jobs with some form of logging to capture exit codes. But wouldn’t it better if workarounds simply weren’t necessary? We certainly think so! Supercronic is a cron implementation designed for the container age. Unlike traditional cron implementations, it leaves your environment variables alone, and logs everything to stdout / stderr. It’ll also warn you when your jobs fail or take too long to run. */5 * * * * * * echo "hello from Supercronic"
INFO[2017-07-10T19:40:50+02:00] starting                                      iteration=0 job.command="echo "hello from Supercronic"" job.position=0 job.schedule="*/5 * * * * * *"
INFO[2017-07-10T19:40:50+02:00] hello from Supercronic                        channel=stdout iteration=0 job.command="echo "hello from Supercronic"" job.position=0 job.schedule="*/5 * * * * * *"
INFO[2017-07-10T19:40:50+02:00] job succeeded                                 iteration=0 job.command="echo "hello from Supercronic"" job.position=0 job.schedule="*/5 * * * * * *"
INFO[2017-07-10T19:40:55+02:00] starting                                      iteration=1 job.command="echo "hello from Supercronic"" job.position=0 job.schedule="*/5 * * * * * *"
INFO[2017-07-10T19:40:55+02:00] hello from Supercronic                        channel=stdout iteration=1 job.command="echo "hello from Supercronic"" job.position=0 job.schedule="*/5 * * * * * *"
INFO[2017-07-10T19:40:55+02:00] job succeeded                                 iteration=1 job.command="echo "hello from Supercronic"" job.position=0 job.schedule="*/5 * * * * * *"
If you’re an Enclave customer, we’ve updated our cron jobs tutorial with instructions to use Supercronic. If you’re not using Enclave, then head on over to Supercronic’s GitHub page for installation and usage instructions. We’re proud to announce that as of this week, Enclave automatically restarts application and database containers when they crash. Thanks to this new feature, you no longer need to use process supervisors or shell while loops in your containers to ensure that they stay up no matter what: Enclave will take care of that for you. Container Recovery functions similarly to Memory Management: if one of your containers crashes (or, in the case of Memory Management, exceeds its memory allocation), Enclave automatically restores your container to a pristine state, then restarts it. You don’t have to do anything, it just works. Automatically distributing your app containers across instances located in distinct EC2 availability zones. Implementing health checks to automatically divert traffic away from crashed app containers. Apps that crash when their database connection is interrupted due to temporary network unavailability, a timeout, or simply downtime (for example, during a database resizing operation). Background processors that crash. For example, all your Sidekiq workers exiting with an irrecoverable error, such as a segfault caused by a faulty native dependency. If you’d like to learn more about this feature, please find a full overview of Container Recovery in the Enclave documentation. 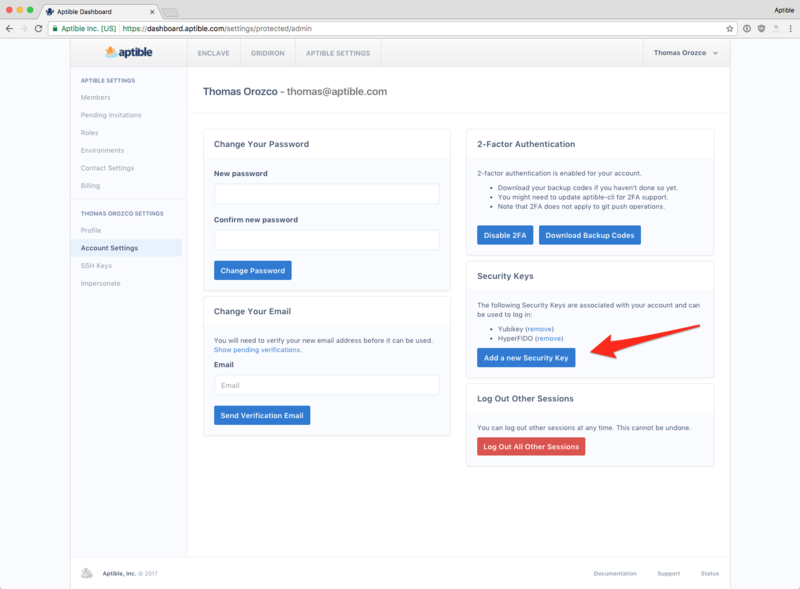 We’re proud to announce that Aptible now supports hardware Security Keys as a second authentication factor! Specifically, Aptible now supports devices compliant with the FIDO Universal Second Factor (U2F) standard. U2F Security Keys can be securely used across multiple accounts, and are rapidly gaining adoption: Google, GitHub, Dropbox, and many others now support U2F Security Keys. Convenience and Security: Pick Both! There are two main reasons to use a Security Key with your Aptible account: increased convenience and better security. With a Security Key, you just touch the key to authenticate. No more fumbling for your phone. But Security Keys also help better protect against phishing, a common and sometimes dangerous attack. Token-based 2FA does a good job at protecting your account against attackers who only learn your password, but it remains vulnerable to phishing: an attacker can trick you into providing your token and try to use it before it expires. Service providers can’t reliably tell the difference between the attacker’s request and a legitimate one coming from you. The origin your browser was pointed at when you signed this response. If you’re being phished, this will be the attacker’s website, whereas if you’re actually logging in to Aptible, it’ll be dashboard.aptible.com. A device-specific response counter that your Security Key is responsible for increasing monotonically when it generates an authentication response. If your Security Key was cloned by an advanced attacker with physical access, inconsistent counter values may reveal their misdeed. The response must be signed by a Security Key associated with your account. Naturally, the signature must be valid. The response must have been generated for dashboard.aptible.com. This protects you against phishing. The response must be for a challenge Aptible issued recently, and that challenge must not have been used before. This protects you against replay attacks. The response must include a counter that’s greater that any count we’ve seen before for this Security Key. This protects you — to some extent — against device cloning. How do I use U2F with my Aptible account? First, you’ll need to purchase an FIDO U2F-compliant device from a trusted vendor. The Aptible team uses Yubikeys, but there exist a number of other vendors. You’ll also need to make sure your browser supports U2F Security Keys. Currently, only Chrome and Opera offer such support, but other browser vendors are working on adding support (U2F support is on the Firefox roadmap for Q2 2017). That’s it! Next time you attempt to log in, you’ll be prompted to touch your Security Key as an alternative to entering a 2FA token. Can I stop using token-based 2-Factor Authentication altogether? No: U2F Security Keys can be added as additional second factors on your account, but you can’t disable token-based authentication. The reason for this is that U2F Security Keys aren’t supported everywhere yet, so you may need to occasionally fallback to a token to log in: not all browsers support them (only Chrome and Opera do at this time), and neither does the Aptible CLI. This may evolve over time, so it’s conceivable that we’ll eventually let you use U2F only. We’re proud to announce that as of this week, Enclave Endpoints support IP filtering. Using this new feature, you can restrict access to apps hosted on Enclave to a set of whitelisted IP addresses or networks and block other incoming incoming traffic. Further lock down access to sensitive apps and interfaces, such as admin dashboards or third party apps you’re hosting on Aptible for internal use only (e.g. Kibana, Sentry). 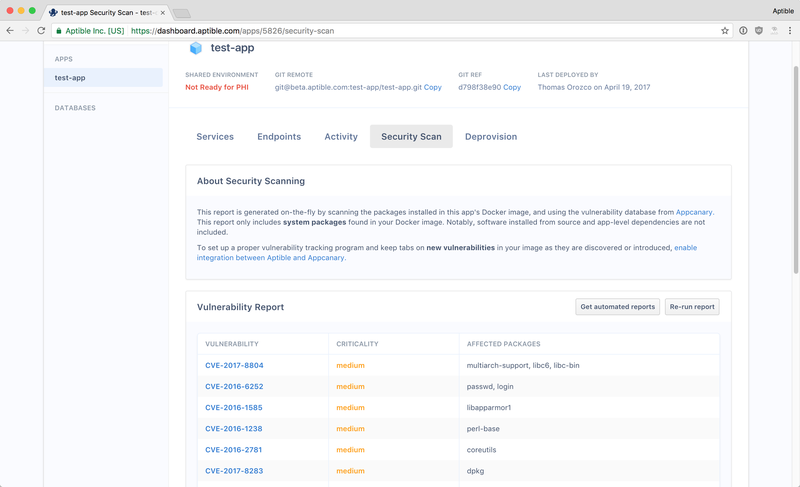 Restrict access to your apps and APIs to a set of trusted customers or data partners. And if you’re hosting development apps on Aptible, IP filtering can also help you make sure no one outside your company can view your latest and greatest before you’re ready to release it the world. Note that IP filtering only applies to Endpoints (i.e. traffic directed to your app), not to aptible ssh, aptible logs, and other backend access functionality provided by the Aptible CLI (this access is secured by strong mutual authentication, as we covered in our Q1 2017 webinar). IP filtering is configured via the Aptible Dashboard on a per-Endpoint basis. You can enable it when creating a new Endpoint, or after the fact for an existing Endpoint by editing it. Enjoy! As usual, let us know if you have any feedback or questions! Until recently, Aptible has used AES-192 for disk encryption, but as of last week, Aptible databases (and their backups) now default to AES-256 instead. While there is no security concern whatsoever regarding AES-192 as an encryption standard, it has become increasingly common for Aptible customers to have their own partners request 256-bit encryption everywhere from a compliance perspective, which is why we’re making this change. If you’re curious to know which encryption algorithm is used for a given database, you can find that information on the Dashboard page for the database in question (along with the disk size and database credentials). We’re proud to announce that as of today, new Redis databases provisioned on Aptible Enclave support SSL/TLS in addition to the regular Redis protocol. 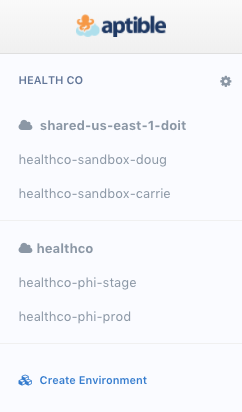 Because both AWS and Aptible require that you encrypt HIPAA Protected Health Information in transit, even within a private, dedicated Enclave stack, starting today you can now use Redis to store and process PHI on Enclave. Most Redis clients will automatically recognize a rediss:// URL and connect over SSL, but review your client’s documentation if you run into any trouble. What about existing Redis databases? For existing Redis databases, Aptible can enable SSL/TLS following a short downtime (about 30 seconds). If you’d like to do that, or have any feedback or questions, just let us know! Contingency planning and disaster recovery are critical parts of any developer’s HIPAA compliance program. The Aptible platform automates many aspects of secure data management, including long-term retention, encryption at rest, taking automatic daily backups of your databases, and distributing those backups across geographically separate regions. These benefits require no setup and no maintenance on your part: Aptible simply takes care of them. That said, recovering a database from a backup has required a support request. While we take pride in providing timely and effective support, it’s nice to be able to do things at your own pace, without the need to wait on someone else. In the dashboard, locate any database, then select the “Backups” tab. Find the backup you would like to restore from, and select the “Restore” action. From the CLI, first update to the newest version (gem update aptible-cli), then run aptible backup:list $HANDLE to view backups for a database, or aptible backup:restore $ID to restore a backup. Restoring from a backup creates a new database - it never replaces or overwrites your existing database. 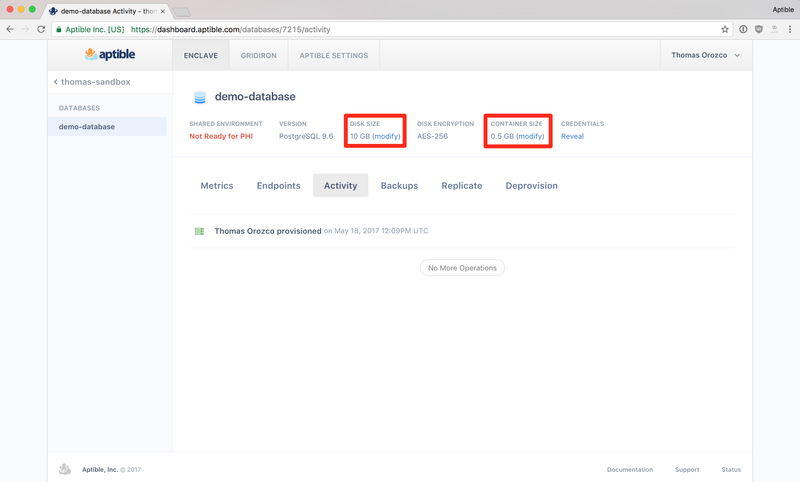 You can use this feature to test your disaster recovery plans, test or review new database migrations before you run them against production, roll back to a prior backup, or simply review old data. When you are done using the restored database, you can deprovision it or promote it to be used by your apps. In addition to displaying automatic daily backups, you can now trigger a new backup on demand from the dashboard or CLI. In the dashboard, simply select the large green “Create New Backup” button. From the CLI, make sure you are running the latest version (gem update aptible-cli) then use aptible db:backup $HANDLE to trigger a new backup. Now, before you do something scary with your database (like a big migration), you have an extra safety net. 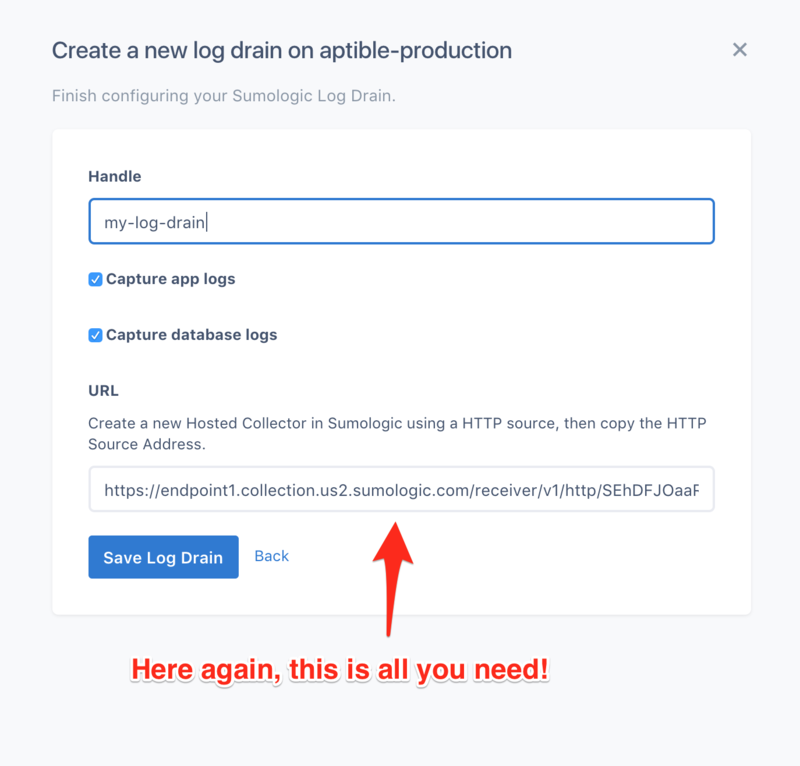 On-demand backups are easier than filing a support request and safer than using a tunnel to dump to a local environment, because you will never have to remember to purge data from your machine. We hope you find both of these features useful! That’s it for today. As usual, if you have questions or feedback about this feature, just get in touch. 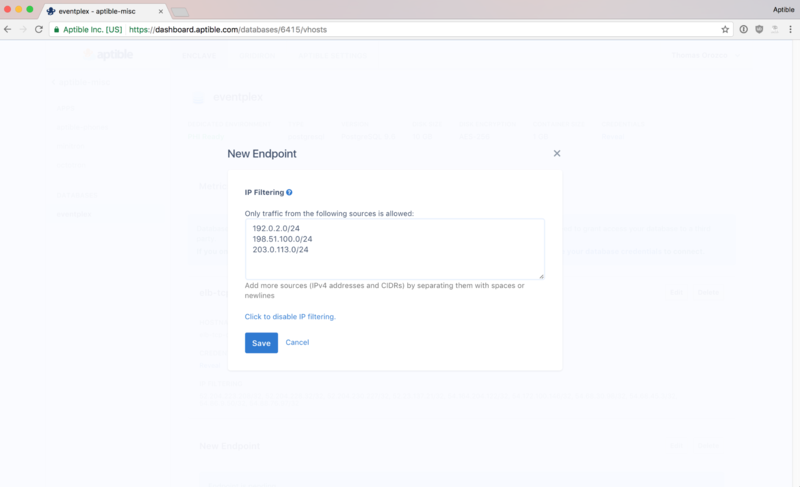 We’re happy to announce that two-factor authentication (2FA) is available for all users and account types in the Aptible dashboard and CLI! Multifactor authentication is a best practice that adds an additional layer of security on top of the normal username and password you use to verify your identity. You can enable it in your Aptible user settings. Aptible 2-factor authentication implements the Time-based One-time Password (TOTP) algorithm specified in RFC 6238. We currently support the virtual token form factor - Google Authenticator is an excellent, free app you can use. We do not currently support SMS or hardware tokens. When enabled, 2FA protects access to your Aptible account via the dashboard, CLI, and API. 2FA does not restrict Git pushes - these are still authenticated by your SSH key. In some cases, you may not push code with your own user credentials, for example if you deploy with a CI service such as Travis or Circle and perform all deploys via a robot user. If so, we encourage you to remove SSH keys from your Aptible user account. When you enable 2FA, you get emergency backup codes, in case your device is lost, stolen, or temporarily unavailable. Keep these in a safe place. If you don’t have your device and are unable to access a backup code, please contact us. As usual, we’d love to hear your feedback! If you have any questions or comments, please let us know!